Alternative sources of capital now contributes at least 4% of the global non-life insurance and reinsurance market’s roughly U.S. $2 trillion capital base, according to Swiss Re. The reinsurance firm puts the overall non-life global insurance capital base at $2 trillion, 80% (or $1.6 trillion) of which comes from primary insurers, 16% (or $320 billion) is from reinsurance firms, with the remaining 4% ($80 billion) coming from insurance-linked securities (ILS) funds, their investors and other alternative capital vehicles. $80 billion seems rather low for an estimate of alternative capital in the industry at this time, which if you include some of the trapped capital is certainly closer to or above the $100 billion mark, according to our data, which puts alternative capital nearer to 5% of global non-life insurance and reinsurance capital. But, whatever the size or percentage that ILS and alternative capital contributes to global re/insurance capacity, it’s certainly a growing component of the overall risk and insurance market. The ILS market has provided a valuable buffer against catastrophe losses for the major insurance and reinsurance players, as well as a source of efficient and lower-cost capital that some firms are now using as their only lever for growth into peak catastrophe exposed zones. 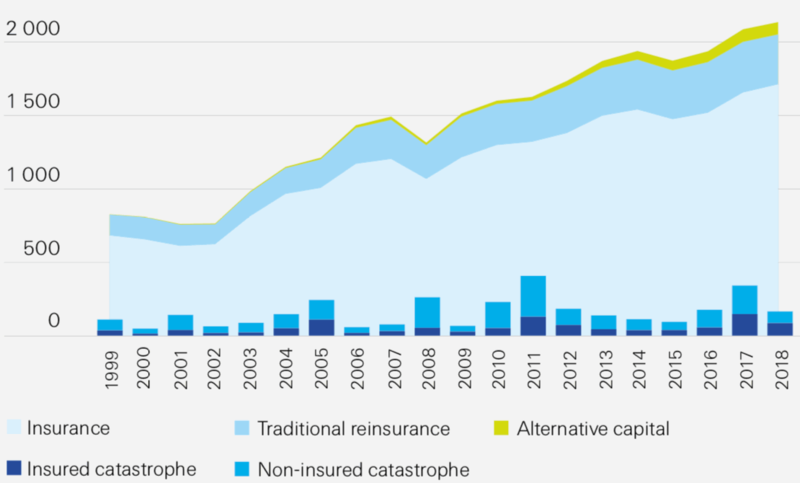 In addition, alternative capital has become the go-to source for post-catastrophe capital raising, as we explained in an article earlier today, and Swiss Re notes that this has been seen after historical events as well as in 2018 following the hurricanes of 2017. “Low barriers to entry for capital to enter the natural catastrophe reinsurance market facilitated the swift replenishment after each disruption. Furthermore, both events were followed by significant improvements in risk modelling and waves of new and alternative capital entering the market,” the reinsurer explained. However, the disappointing price increases in 2018 as well as continued loss creep from hurricane Irma and fresh losses from aggregated catastrophes and weather, topped off by the wildfires at the end of 2018, have served to dent investor appetite somewhat, Swiss Re notes. “We observe that the appetite of investors in the AC segment to take on new risks did wane slightly over 2018,” the reinsurer said. We’d suggest that in many cases it is more a case of investors in observation mode, wanting to see how the ILS market deals with its losses and trades forwards, as well as a desire to see that rates are indeed rising in 2019, something that has become evident after the April renewals, then rising ILW pricing for Florida and the much higher premium rates in the catastrophe bond market. A period of consolidation and reflection was always going to occur after the heavy losses suffered. But with some of the leading ILS managers having only seen low single digit losses in 2017 and 2018, there remains plenty of appetite to replenish and upsize portfolios going forwards, but this is likely to only become really apparent into 2020 and beyond, we feel (fresh losses being the main wildcard here). Longer-term though, Swiss Re reiterates its view that alternative capital is here to stay, something the firms own CEO has previously suggested to be the case (and again here). Alternative capital has, “matured into an integral player in the growing market for catastrophe risks,” Swiss Re believes. Which suggests there are clear opportunities for growth of ILS, catastrophe bonds and alternative reinsurance capital, as, “Re/insurance demand will rise faster than economic growth due to dynamic industrial growth and urbanisation in emerging markets, and also as the increasing value of assets located near coastal areas in mature markets, which are often vulnerable to natural hazards,” the reinsurer explained. Will alternative capital ever grow to 10% of overall insurance and reinsurance sector capital? It’s possible, if reinsurers continue to embrace a multiple and third-party capitalised balance-sheet approach, if ILS players continue to add leverage and rated paper of their own, if pools of primary insurance risk are increasingly directly backed by institutional investors, and if insurance and reinsurance risk becomes a traded instrument, with the necessary liquidity to attract the capital markets en-masse.